I absolutely never post twice on the same day, but after that long article, I just had to post something pretty and positive for my readers tonight! My friend Jeanne Haight has been so kind, from practically day one of this blog, to share photos with me of her dogs. The resident queen at the Haight household is Morgen, pictured above after a recent groom. She always has such a soulful, deep look in her lovely dark eyes. The little mustached boy beside Morgen is "Cole", a Moyen sized Poodle from Crabapple Downs. I mention their breeder because reading a recent article on her website actually was the inspiration for the article below about health versus showing, etc. Arlene Mills is the breeder of Jeanne's sweet Morgen and Mr. Cole. I found the honesty in Arlene's link on her website entitled "Genetic Research/Poodle Health Registry" quite refreshing. 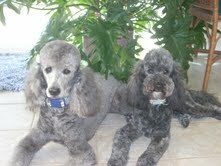 Thank you Jeanne, for sharing photos of your sweet Poodles! Happy St. Patrick's Day, give them a green cookie from me tomorrow! Dog Showing, fancy titles...HEALTH AND ETHICS? I chose the above photo to illustrate this post, simply because it is one of the few photos that I have of any of my Poodles through the years in "show coat". Actually Kate was not yet in full coat as she was a pup still growing hair when this photo was made, I believe she was about five months old. But at that time, I still had high hopes that she might turn out to be a show dog. She had been to a fun match and a month or so later she visited a big name show handler for the first time but unfortunately, due to no one's fault as far as I know, she came back home with a broken front leg. So she spent from age six and a half months to eight or nine months healing, and afterwards was never quite the same, as far as the quality of her movement. Unfortunately, as the years passed, she also developed seizures, so I did not show her in other venues, such as obedience or rally. But she has always been such a smart girl, and when she was younger, she did have a good time being a training demo dog in the training classes back when I owned Bed & Biscuit. But Kate's history is not the topic of this article! What I'd really like to know is, what do you think actually makes a breeder of Poodles an "ethical" breeder? Many people think that in order to be an ethical breeder, you must show off the quality of your breeding stock in the show ring. 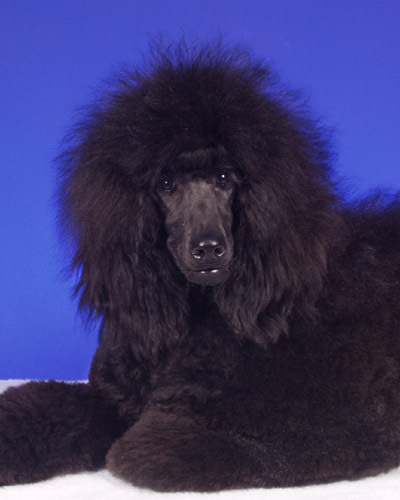 This has often been a problem for Poodle lovers, because the type of grooming required to compete successfully in the AKC show ring is very time-consuming, and requires a great deal of talent. The other option is, send your dog off with a professional handler. They will be beautifully groomed, and will often have an "edge" in winning because of the handler's experience and connections. But unfortunately, this can be an expensive option and it also requires your dog to be away from you for a certain portion of his or her life. Many Poodle breeders have switched from AKC to UKC, because the United Kennel Club allows Poodles to be shown in clips that do not require such extensive grooming and in UKC, dogs are shown by their owners or co-owners, no professional handlers allowed. In addition,UKC allows multi-colored Poodles to be shown, while AKC follows the guidelines established by PCA (Poodle Club of America) and they allow only solid colors to be shown in conformation towards their championships. Other colors can be shown in performance venues, like agility, rally and obedience, but a black dog with just a spot of white no bigger than a silver dollar on his chest would be disqualified from the AKC conformation ring. Because of the difficulty of showing Poodles (towards AKC championships), some people feel that is ethical to breed Poodles without obtaining championships but still think that the breeding dog should prove its value in some area of competition. For example, it should have an agility or rally title, or a hunting dog title if it does not have a championship title. I want to put a thought out for you to consider. It is wonderful if a breeder has the drive, the money and the talent to show their dog in one or more of these areas. BUT, it does not make that breeder any better or worse than a breeder who does NOT show their dogs. Ouch, you may be thinking, or that statement may even make you a bit hot under the collar. Some folks are so angry they are about to go grab a chocolate bar or a beer out of the refrigerator, if they haven't already clicked off this article! I want to put out a FACT for you to consider. The fact is, Poodles, of all sizes, are a breed of dog that, unfortunately, is plagued with a number of serious health problems. In addition, they also have certain areas of their structure, such as front assembly, that are often faulty. Could it be that instead of concentrating on the color of their coats, or the value of an AKC championship, breeders should be thinking more about other things instead? The health problems we have in Poodles are not simple, nor are they things which do not affect the quality of the dog's life as a pet. For example, the most common health problem in a breed that I have shown for many years, Siberian Huskies, is juvenile cataracts. Juvenile cataracts do not hurt the dog. In the majority of the cases, they are not progressive, meaning that they do not cause vision issues, in fact many people own a Siberian with juvenile cataracts and have no clue that the dog has cataracts unless they have the dog checked by a canine ophthalmologist. So if a show dog has his eyes checked and this problem shows up, typically a breeder simply removes the dog from his or her breeding program, neuters the dog and finds the dog a loving pet home. I've known dogs with juvenile cataracts who lived to be 14 or 15 years old without a single sign of vision problems. In recent years, there is an option to have cataract surgery if it is needed, and this actually is often done in other breeds, but is rarely necessary for a Siberian. In Poodles however, particularly in the variety I love (Standards) we DO have health problems that affect the quality of the dog's life as a pet. Hip dysplasia, for example, can cause the dog a great deal of pain (not always, it depends on the degree, but some dogs with HD must have hip replacement surgery in order to live pain-free). Epilepsy is often life-threatening. I have been fortunate in that my dogs that have had seizures have had them very rarely but I have known Poodle owners whose dogs had grand mal seizures, the dogs were seen by many specialists and various medications were tried but the seizures could not be controlled and eventually the owners had to make the painful decision of putting their dog down in order to end the suffering. Bloat (gastric torsion) is an EXTREMELY painful medication condition that is often fatal. I have owned a Standard who bloated, and he did survive, but it made a huge dent in our finances to save him. Not everyone has the money to have the surgery done when this emergency occurs, in some areas of the country now it can cost over $5,000!! And also I have known someone who was right with her dog when it bloated, the dog was laying under her feet at her desk and she rushed it IMMEDIATELY to the vet for surgery but it did not live. Von Willebrand's Disease is a blood clotting disorder that can be fatal. There are skin disorders in Poodles, such as SA, that can be miserable for the dog and the owner who is caring for it. 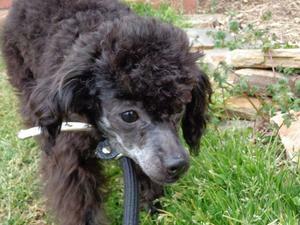 Addison's Disease is an auto-immune disorder that claims the lives of many Standard Poodles. Eye problems in Poodles can lead to blindness, even at an early age. I could go on and on, but if you are interested in learning more about Poodle Health problems, one of the best places to visit is the Diversity in Poodles website, which contains articles about various health problems, as well as research that has been done on certain bloodlines to educate breeders as to where some of the problems may have originated. All this said, I firmly believe that "ethical", when it comes to Poodle breeders, is tied totally to how that breeder views health problems. Does the breeder test their breeding stock and if so, for what problems? Here is an excellent page on the Poodle Club of America's website, which has a paragraph about each serious health problem in Poodles, and you can also read about genetic health testing that they recommend: Poodle Club of America--Health. Also, most Poodle Club of America members now firmly believe in the value of using genetic diversity to reduce health problems, as opposed to linebreeding or inbreeding closely. This is different than what is done in many other breeds of purebred dogs, so if you are looking to purchase a Poodle and you want to make your choice based on health and longevity, then that is another thing to ask the breeder, are they willing to share the dog's pedigree with you, including a pedigree that has calculated ratios of inbreeding? This may sound confusing but there are many articles on the internet that help explain this concept and how its value is now being used by Poodle breeders throughout the world. So, to summarize, I would like to state that, unlike what I have often considered, when purchasing a dog as a pet or show dog in the two other purebred dogs I am most familiar with (I have shown Siberian Huskies and Australian Shepherds for quite some time), when I am looking for a POODLE, how many showing, performance or working titles are in the pedigree are NOT something that factors highly in my decision. I would even buy a Poodle from someone who has never shown a dog in any venue, if that person is a knowledgeable dog person who understands structure, movement, temperament and who breeds for good health. Someone who will even start all over with a different bloodline if they find out that there are multiple problems showing up in the offspring, even take a beautiful champion female and spay her and just love her......instead of continuing to breed her if she is producing dogs that bloat, or have immune system disorders like Addison's disease, thyroid problems, day blindness, etc....this is the type of breeder that I want to work with. Because, believe me, a pedigree full of champions doesn't mean a thing when you have a dog on your lap, screaming in pain because his stomach has twisted, while your husband is driving ninety miles an hour to the vet's office to try to save his life. I know. I have experienced it. I have experienced the relief of a dog who lived after his bloat surgery (although his heart murmur got much worse and he had a heart condition that caused him a lot of problems in the remaining two years that he lived). But.... I have also held a client's dog years ago in my lap while he was literally crying and screaming, and experienced him drawing his last breath the second we pulled into the veterinarian's parking lot. It took us exactly ten minutes to get there, so no, the dog did not die due to length of time to get medical help. Bloat is not an easy way to go, let me leave it at that. I have personally never seen a dog exhibit as much pain as that particular dog did, it still hurts me to think of it. Let's work together folks. 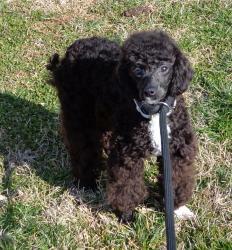 Poodle breeders, I want to beg you to start using resources like the Poodle Health Registry. If a dog of your breeding experiences a problem that could have a genetic link, please list it on the registry. I know, you are afraid that people will stop buying your dogs if they see more than one dog with your kennel name pop up on the registry. But you know what might happen? If you are not repeating the breedings that produced the problems, but instead are heading in another direction and doing everything you can to produce healthy dogs, they might actually spread the word that you are an ETHICAL breeder, and someone to be trusted! They might even care more about this than about the number of champion dogs you have produced! Don't get me wrong, I love seeing Poodles in the show ring,and I ADORE watching Poodles in the agility, rally and obedience rings. And when I see working Poodles on television, retrieving ducks, I am ecstatic! But unless we have breeders that are diligently working to produce healthy Poodles, then none of us can enjoy any of these dog sports. The beautiful Poodle at the top of this page could have easily gotten obedience titles, but since she had a seizure one time after an all day dog training workshop, I decided she would have her fun in life primarily as a companion, because God forbid I put the stress of a dog show on her and cause her to have a grand mal seizure because of my own desire to put another title on a dog. I have put titles on a dozen or so healthy Siberian Huskies and a couple of Australian Shepherds, there is no reason to risk the life of my beloved Poodle over a dog show title. I have not yet put a title on a Poodle, because I have not had the privilege of owning one that had both the quality and the health required to be a good show dog. I do hope to be in the UKC ring soon, with a healthy dog, or at least a dog that has a high likelihood of remaining healthy, because his parents have all their health clearances. But if he doesn't stay healthy, it will not be because his breeder did not do everything possible to try to produce a healthy dog. That's all I ask folks. Put health first. Numerous organizations are doing research on Poodle health issues, and few breeds have resources like the Poodle Health Registry or organizations like VIP (Versatility in Poodles, another great website if you wish to learn more about Poodle health issues). The resources are out there, for anyone who truly does wish to work on breeding a healthier Poodle. 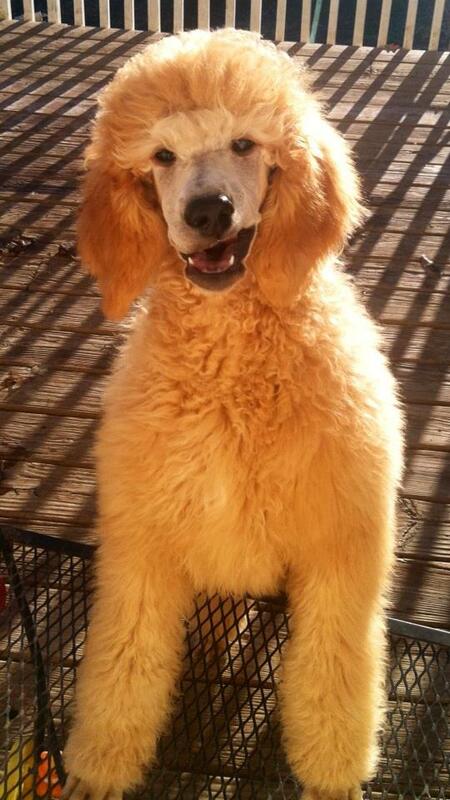 If you are going to adopt a Poodle from a rescue group, God bless you. But if you are going to buy one from a breeder, don't base the decision on how many championships the breeder has produced. Do your research, and work with an ethical breeder who cares about health issues. Does the breeder say that the sire and the dam of the litter have health clearances? Ask for a copy! A good breeder will not be offended, and many breeders now list a dog's health certification numbers right on their websites, if the dog is old enough to be checked clear and if the dog is in their breeding program. It is worth the time to seek out such breeders. Why? Because Poodles are special. And when you lose them, or even when you have to watch them go through various health issues in life, it HURTS. Not just the dog. It hurts YOU. 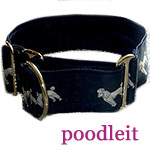 Protect yourself and the breed by supporting ethical Poodle breeders. Thoughts? This blog is moderated, so it may take a day or two to show up, but your comments are always welcomed and appreciated! (c) Melanie Schlaginhaufen, 2013, all rights reserved. For permission to reprint, you can contact Melanie through her website, www.knowingdogs.com. 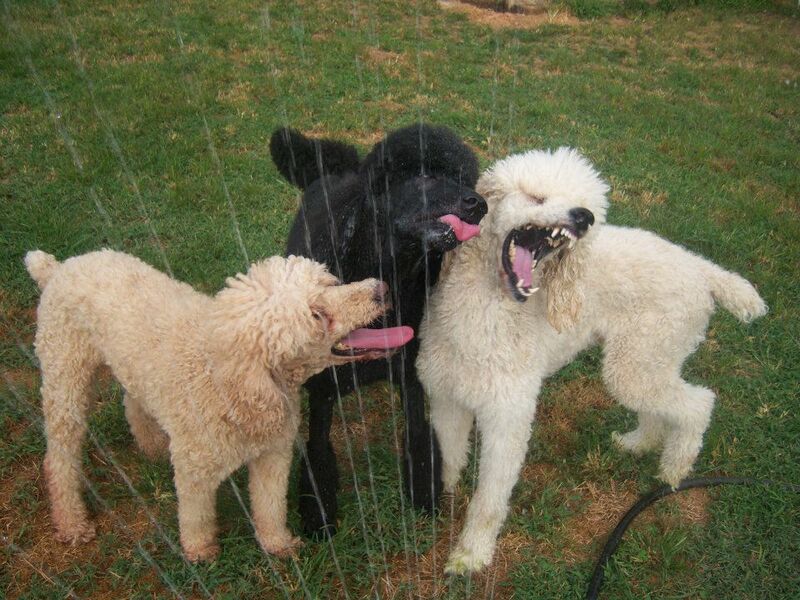 When my friend Becky Godbey posted this photo of some of her Poodles having such a wonderful time playing in the sprinkler, I couldn't resist asking if I could share it with you. After all, it was sixty degrees here in the southern Virginia mountains today so Spring is definitely on its way! I feel almost guilty talking about it when some of my friends in New England are buried under 20 inches of snow. Prayers that soon warm weather will be headed your way as well. These are a few of Becky's beloved pets enjoying themselves in the backyard, but Becky also shows beautifully bred show quality Standard Poodles. But each one of Becky's dogs is loved just the same, as you can see from the fun that two of her rescued Poodles are having in this photo! 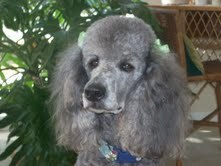 For more about Becky and her Poodles, please visit her website: Magic Hour Poodles. From left to right, the adorable dogs featured in the photo are: apricot Aries (special sweet puppy mill rescue), in the middle is "Rush"-Prodigy's Magic Hour Adrenaline Rush and the cream boy with his teeth expressing his enjoyment is "Aubrey", Becky's cream rescue boy. Thanks so much Becky, for sharing this photo with our readers! 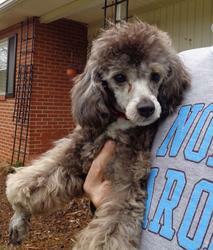 Lovely Poodles in Rescue Need Homes! Today I found out an amazing thing, a Jack Russell rescue organization in Greensboro, North Carolina found out about a rural NC breeder who decided to retire and surrender a total of 14 Poodles, and they stepped up to help. Pilots and Paws Volunteer Pilots were kind enough to fly all 14 dogs from Henderson, NC to this rescue group in Greensboro, NC in February. They have even been professionally groomed, and they are doing well on crate-training, so they are well on their way to becoming housetrained. As with all of the dogs in the care of Finding Great Homes for Great Jack Russells Like You, adopters must qualify so that each dog is carefully matched to its forever home.There is an adoption fee to help cover the cost of their medical care, and to help this group continue to save special animals like these. You can see more information on each dog, including age, adoption fees and other details, on the group's list of adoptable animals on Petfinder (see link at the bottom of this post). This little sweetie below is so gorgeous, I am coveting him for my own! I still have to convince my husband that it is time to add another forever family member, but I am working on it. Isn't he lovely? I believe that Robin, the group's director, told me that he is about 11 pounds now. Although they came from a toy Poodle breeder, some appear to be true Toy size, in that they will mature under 10 pounds, while a few might be a little larger, like small miniature Poodles. Most all of the males were young, like 6-8 months old but since they came from a breeding situation, some of the females are adults of varying ages (but there are some females under the age of a year as well). Butler (above) and his two male brothers are still puppies,but all are doing well on their crate-training, and are learning how to walk on leash. Butler looks like he will be mature to be a light apricot or a cream with apricot markings. One of his brothers is a white and silver parti-colored boy, and the other brother, Carson (below) looks like he may mature to be a blue with a tad of white markings on his face. If you are looking for a dog just a tad bigger, there is even a 20 pound Cockapoo, Scout, you can see his photo and read about him on their Petfinder site, as well as the inevitable extremely appealing Jack Russells and other dogs who are blessed to be in this group. There are detailed write-ups about each dog, and most have several photos, and their adoption fees are listed on Petfinder as well. Their adoption center is open daily 10-5, but they will even set up other times if needed to work with an approved adopter. See the link to their website under their logo at the bottom of this post--you can find their email and even an adoption application on their Petfinder website link. It is my goal to get down to Greensboro to meet these Poodles and this group's director, Robin Manley, hopefully within the next week, so I will have a true "interview" about their group to post for you soon. 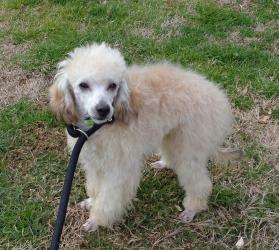 In the meantime, will you help network so that these precious Poodles will find their permanent homes very soon? I think anyone who is in a position to adopt would be blessed to have one of them, I'm sitting here ready to fill out my adoption application and write my check, but even if hubby doesn't give approval to my desire to adopt---I can still do what each of you can do---we can all help by networking, and by giving donations to help them keep up the wonderful work that is being done so that more dogs can be saved! Remember, every donation, even five dollars here and there, adds up. Veterinary care is, unfortunately, quite expensive. Also, if you happen to live in the Triad area, please get in touch with Robin to find out about volunteer opportunities. If your heart desires to help, there is always something to be done! What is this adorable pup saying? Thank you Denise Spotila for allowing me to post Charm's photo. Let's have some fun, and see who can think of the cutest caption! Just click on Comments below (it may say 2 comments 5 comments, whatever, but will take you to a space to type in your comment, takes just a moment of your time). You do not have to be a follower of the blog to comment, but if you are, make sure you go to the blog, www.poodleblogger.com to post your comment so it will count towards the contest! Denise, will you and Charm help me judge the best CAPTION in a couple of weeks? The Winner will receive $10, hey, it's not a lot but what a fun way to earn a little pocket money!